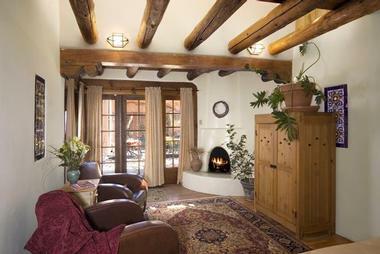 Santa Fe inns offer beautiful architecture, unique décor inspired by the local heritage, and friendly service. Check into one of these stylish hotels and inns for a weekend of relaxation, rejuvenation and new experiences. Some of the inns on our list feature luxurious spas where you can get pampered after a day of exploring the town. Many have their own restaurants where you will have a chance to sample tasty food and wine in a romantic setting. You may also like: 21 Best Things to Do in Santa Fe. Top things to do in Santa Fe for couples who love art: Canyon Road, the New Mexico Museum of Art and the Georgia O’Keeffe Museum. 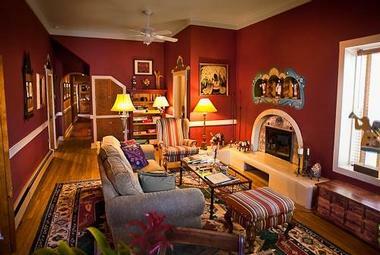 Hacienda Nicholas Bed & Breakfast is a charming, cozy, and enchanting inn located in the heart of historic downtown Santa Fe. 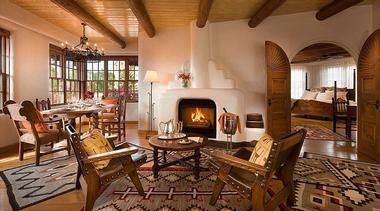 Inside its thick adobe walls are seven peaceful rooms and suites varying in size and amenities. Some feature mini-kitchenettes, kiva fireplaces, double Jacuzzis, and private patios. For guests seeking a more private setting, Hacienda Nicholas has four large, spacious vacation rentals with full kitchens and plush amenities available just outside the main property -- perfect for honeymoons and romantic getaways. Guests can indulge in a relaxing massage and luxurious rose petal bath at the Hacienda’s award-winning Absolute Nirvana Spa, which specializes in traditional Indonesian spa and facial treatments and uses the highest quality organic oils and ingredients. The inn serves organic coffee, daily Southwestern breakfast made from local organic ingredients, and complimentary wine and appetizers during Wine & Cheese Hour. Rooms start at $154. Located within easy walking distance of historic downtown Santa Fe, the charming El Paradero Bed and Breakfast Inn offers an alluring balance of quiet and bustling spaces inside a 200-year-old farmhouse. The city’s oldest inn features nine rooms on the ground level, four rooms in the main house, and two suites in the adjacent 1929 double brick coachman’s house. 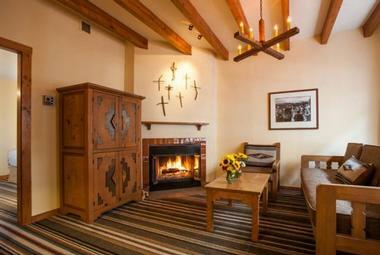 Some of the rooms offer enchanting mountain views from balconies, and some contain original kiva fireplaces. All rooms are adorned with unique Southwestern décor. Guests can relax in the inviting living room, peruse the library, use the guest computer, enjoy coffee and a cookie day or night in the snack nook, or soak up some sun in the walled-in rear patio. Guests can also enjoy a free breakfast every morning, when El Paradero serves up traditional and contemporary Southwestern dishes in the dining room. The historic downtown nightlife, the Plaza, the well-known Canyon Road, and the Georgia O’Keefe Museum are all a short walk away. Rooms start at $125 per night. 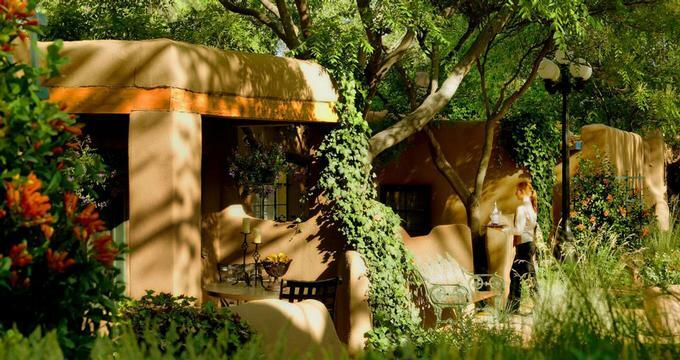 A unique cultural experience awaits guests of Hotel Santa Fe, The Hacienda & Spa, located in the Railroad District of historic downtown Santa Fe. The hotel is situated on three acres and has 128 rooms in the main building as well as another 35 special luxury rooms and suites in the Hacienda that are serviced by professionally-trained butlers. All guest rooms are powered by solar energy. Guests can get a full day of relaxation and pampering at the spa, which offers a variety of soothing massages, heavenly skin care and nail treatments, facials, body treatments, reflexology, and even Native American and East Indian energy work and cleansing rituals. 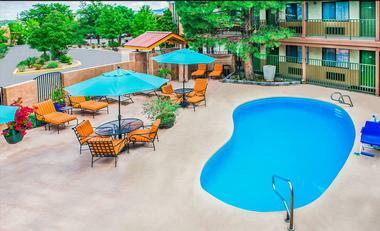 They can then enjoy a dip in the pool or hot tub after visiting the state of the art fitness center or sip tasty spirits while listening to live music every Friday night. Amaya, the hotel’s exquisite restaurant, has local Pueblo and Northern New Mexican influences. The restaurant offers private teepee dining, perfect for couples seeking a romantic getaway. Rooms start at $179 per night. Just two blocks from the famous historic Plaza, the Inn of the Governors is perfect for a romantic weekend getaway. The charming hotel has 100 beautiful Southwestern-motif rooms, including some with garden patios and authentic, wood-burning fireplaces. Also available are 392-square-foot mini-suites with private balconies. Guests can feast on the Inn’s complimentary breakfast buffet, enjoy a dip in the heated swimming pool, and take advantage of the evening tea and sherry hour. The hotel even has playing cards and board games available for guests’ leisure. The Inn of the Governors’ in-house bar serves tasty margaritas and light bar food. With a number of amazing restaurants, bars, and nighttime venues so close to this hotel, visitors are sure to enjoy downtown Santa Fe’s nightlife to the fullest extent. Rooms start at $169. The Old Santa Fe Inn, located only four blocks from the historic Plaza, is a quaint hotel offering an affordable historic downtown experience. 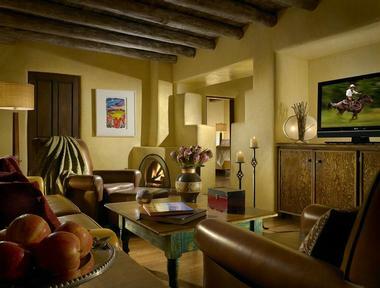 The establishment’s 43 rooms are decorated with authentic Southwestern charm and artwork from local artists. 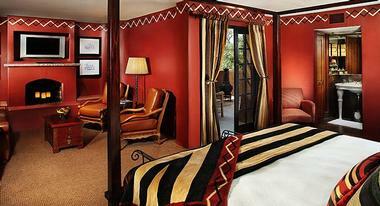 Deluxe suites with Jacuzzi tubs, kiva fireplaces, plush robes, and private balconies are also available. 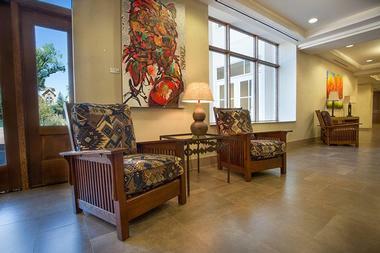 The Inn offers a free full breakfast and many other amenities such as free Wi-Fi, a business center with three guest computers, a 24-hour fitness room, and Starbucks coffee and Tazo teas that are always available in the lobby. There are dozens of restaurants in the immediate area. Guests can take an easy stroll over to the Palace of the Governors, where Native American artisans gather to sell handmade jewelry and crafts. Downtown Santa Fe’s unique shops, art galleries, and museums are all within walking distance. Rooms start at $161. 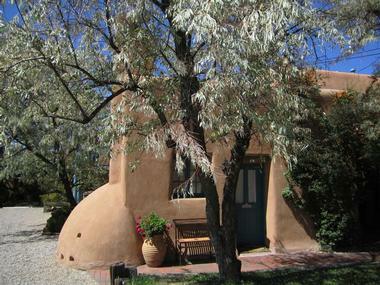 The Pueblo Bonito Bed and Breakfast Inn is a traditional New Mexican lodge in historic downtown Santa Fe. Pueblo Bonito offers a unique vacation experience in an intimate, private setting. Inside its thick adobe walls, twelve rooms and seven plush suites feature artwork by local artists, antiques, viga ceilings, nichos, kiva-style fireplaces, and a relaxed, quiet atmosphere that captures the Southwestern spirit. Some of the rooms have private entrances. Pueblo Bonito offers warm, friendly, and highly-personalized service and serves up a complimentary breakfast every morning. Guests can soak up some sun on the sundeck, cool off in the shady garden, and enjoy the compound’s quiet courtyards. Built at the turn of the twentieth century, Pueblo Bonito has a rich and colorful history. It is conveniently located within walking distance of Santa Fe Plaza, the Old Santa Fe Trail, the New Mexico State Capitol building, San Miguel Mission, the Oldest House, Loretto Chapel, and Canyon Road. Rooms start at $145. 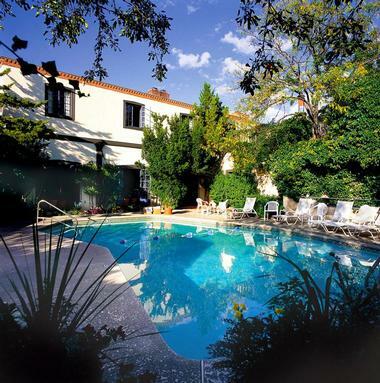 Sitting on two beautifully landscaped acres, the Inn on the Alameda is centrally located in the heart of historic downtown Santa Fe and is the closest downtown hotel to the Canyon Road galleries. There are ten adobe buildings on the property comprising 72 rooms of various sizes, including more private, casita-style suites with wet bars, kiva fireplaces, and secluded patios. Guests wake up to the complimentary “Breakfast of Enchantment” buffet and enjoy a complimentary wine and cheese hour in the evening. A downtown courtesy shuttle helps guests explore historic downtown Santa Fe and return to soak in the outdoor hot tub, peruse the lobby library, or utilize the fully-equipped gym. The Inn’s restaurant, Agoyo Lounge, offers a well-balanced menu based on locally grown ingredients and regional cuisine. Santa Fe’s best restaurants and cultural spots are all within easy walking distance. Rooms start at $195. Historic downtown Santa Fe’s Rosewood Inn of the Anasazi is an intimate boutique hotel offering culturally-rich luxury lodging. 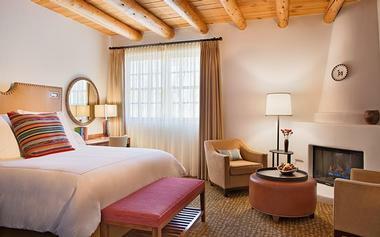 The Inn’s 58 guestrooms embrace the tradition and spirit of the region’s native people. Premiere suites with one- or two-bedroom options are available, featuring plenty of space for relaxing and entertaining, a fireplace, and other upscale amenities. Babysitting services allow parents to enjoy in-room massage and aromatherapy treatments. The elegant in-house Anasazi Restaurant and Bar serves classic New Mexican dishes made with fresh, seasonal and regional ingredients, while The Patio serves signature Southwestern dishes and margaritas in a chic outdoor setting. The Wine Cellar can accommodate up to twelve guests for a private candlelit dinner and a night of enjoying fine wines. Rooms start at $345. The Drury Plaza Hotel in Santa Fe sits on five stunning acres in the heart of the historic downtown district, making it a luxurious oasis to return to after a day of exploring this beautiful old city. The historical hotel has 182 spacious, light-filled rooms with authentic Territorial decor, amazing views of the Santa Fe skies, spacious sitting areas, and oversized bathrooms. Capacious two-room suites with jetted tubs are also available. After a day of shopping at the nearby galleries, guests can catch the sunset while sipping on a delicious cocktail at the hotel’s poolside rooftop bar overlooking the breathtaking Sangre de Cristo Mountains. The Drury Plaza Hotel serves a complimentary hot breakfast every morning as well as hot food and cold beverages every evening. Rooms start at $200.